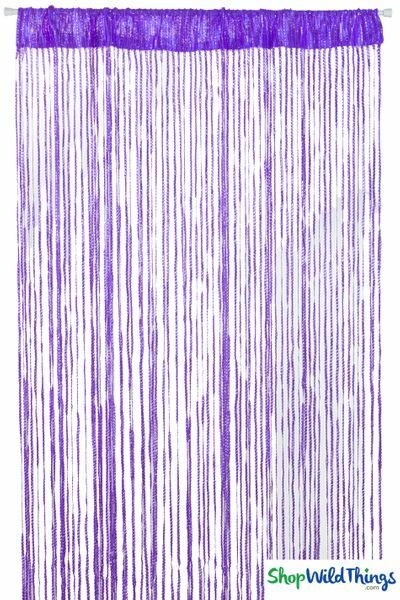 Our fabulous new purple polyester string curtain is 40" wide by 81" long and what really makes this curtain pop is the bright silver strand woven into each colored strand! Each colorful strand is 3/16" wide and there are a total of 80 strands, each about 1/4" apart. This dark purple shade looks very regal and majestic. The rod pocket is 3" deep and this curtain comes with its own tension rod that expands from 24" to 45" so you can scrunch the curtain together for a denser look or spread it out to the full 40". This curtain is very easy to install and the silky soft strands won't tangle. The quality tension rod is sturdy and it's really simple to adjust the height and width. 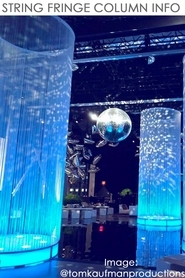 Add color and interest to a wall, window, doorway or use as a room divider. This curtain is also great for hiding or altering the appearance of a closet, pantry or treasure room! I used it as a halloween decor. It looked great and the rods were a useful. My teenage granddaughters and I got inspired. We mounted them on the wall, pulled them back, to reveal a collage of photos and mirrors, It's beautiful. Who knew?